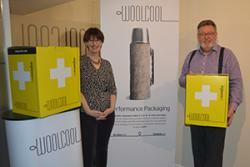 Angela Morris and Keith Spilsbury of Woolcool with the new LifeGuardian pharmaceutical boxes.Ever wondered how sheep survive on those cold, wet hills? Their wool has amazing insulation properties to keep them warm, and man has taken advantage of their fleece for millennia. But to keep things cool? Shropshire based Woolcool, a market leading company specialising in bio-based insulated packaging, engaged the BioComposites Centre to research deeper into the temperature control and moisture buffering properties of wool as part of an Innovate UK funded R&D project to develop an innovative and sustainable new packaging material for the safe shipment of temperature sensitive medicines, particularly vaccines, around the world. Understanding how wool interacts with the environment and how it acts as a thermal and moisture buffer has enabled Woolcool, to develop ground-breaking, sustainable packaging materials for food and pharmaceutical cold chain distribution that outperforms man-made insulation materials such as polystyrene. 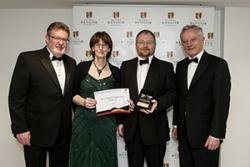 Finalists at Bangor University Impact and Innovation Awards 2015, Keith Spillsbury and Angela Morris of Woolcool with Graham Ormondroyd of Bangor University’s BioComposites Centre and Professor John G Hughes, Vice-Chancellor.Woolcool use 100% pure wool in their specialist eco-friendly packaging products and packaging materials. Their insulated packaging has been developed for use in the fresh food and pharmacology industries, which are reliant on the guarantee that the perishable or sensitive contents maintain a stable temperature while being delivered. Having worked with scientists at the BioComposites Centre, Woolcool have gained an important technological insight as to how exactly how their wool insulation works and underlined the confidence that their products keep contents at required constant temperatures for longer than conventional packaging, and meet or exceed European packaging standards. “Wool is one of nature’s most amazing ‘smart fibres’, with a complex structure and natural properties that cope with extremes of cold and heat. “Our testing has been able to prove the performance properties of wool as a packaging material and has enabled the company to expand, they now employ 40 people at their new factory. This new material has quickly established its credentials in an important niche market. The BioComposites Centre’s work on the development of wool based packaging solutions for food and medical based applications was shortlisted for the Best Business Innovation (sponsored by Siemens Healthcare Diagnostics) Award in the University’s third annual Impact and Innovation Awards 2015.